For the Morag Tong quest, see Grandmaster. Achieve the highest rank by dueling with Vantinius in the Arena. Speak with Varus Vantinius in Ebonheart. Duel him in the Vivec Arena. Once you've reached the rank of Knight of the Garland in the Imperial Legion (through the previous quest) you can ask Varus Vantinius for advancement to learn that there can only be one Knight of the Imperial Dragon in Vvardenfell. 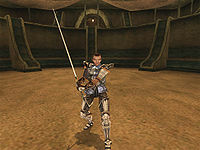 He suggests a duel for the title in the Arena in Vivec. Vantinius can be tough, especially since you probably just turned in two powerful artifacts for him to use. Once he is dead, however, you will regain the two powerful items: the Lord's Mail and Chrysamere. If you complete any quest in the game that involves the keyword duel, you can talk to Varus about a duel. One such quest is the House Redoran quest Ondres Nerano's Slanders. If you duel him before giving him the Lord's Mail and Chrysamere, he won't have them on his body after you kill him, but this doesn't really matter, since you can go get the artifacts afterwards if you so desire. You can go to the top of the pit and blast him with Marksman weapons or spells (though be careful with high radius spells--don't hit the two people wandering around the top). Varus has a hard time hitting you if you stand on one of the slightly raised "spines" of the pit, making a helpful alternative for those that can't use ranged weapons or spells. After completing this quest, you no longer need to be wearing a uniform of the Imperial Legion in order to talk to its members. 10 Varus Vatinius challenged me to a duel. I must meet him in combat with weapons of my choosing in the Vivec Arena. 100 Finishes quest I won the duel against Varus Vatinius. I am now the Knight of the Imperial Dragon of the Order of Ebonheart. This page was last modified on 15 December 2013, at 16:11.